Blend the first ten items (that’s everything but the pasta and greens) in a blender until smooth. Cook in a saucepan over medium heat until thickened, whisking or stirring frequently. Meanwhile, cook the pasta and broccoli. You can steam the broccoli quickly in the microwave, or another option is to use all frozen veggies and throw them into the pasta pot just before draining. On nights when I am feeling super lazy or overwhelmed, I’ll just use frozen peas and frozen spinach. Carrots, corn, whatever. But if the veggies are too much for you, you can leave them all out. There is no guilt with this stuff, so do what you like. 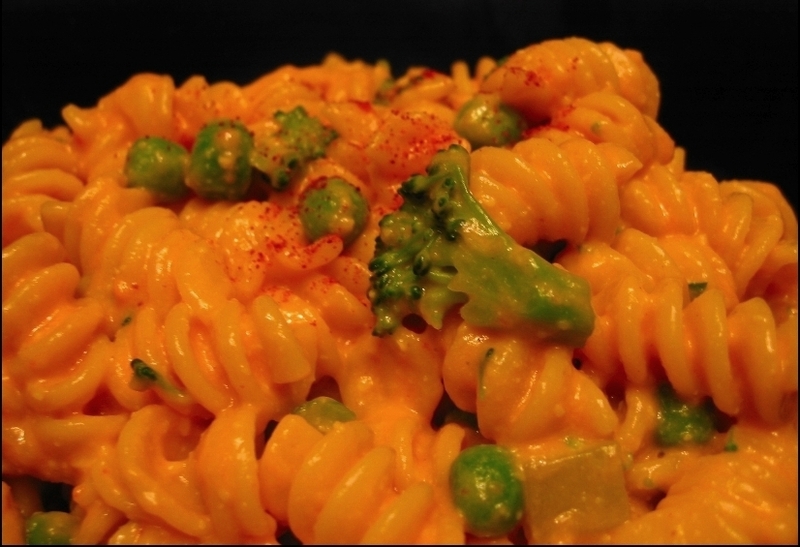 Pour the sauce over the drained pasta and mix well, then stir in the broccoli and peas. Serve with a sprinkle of paprika and eat. Then have seconds.